Bike in Provence - A Painter’s Paradise!! This bike tour in Provence takes you through an amazing region in France. The never-ending beauty and colors of the Provence region that have been artistically depicted on so many canvases (Monet, Matisse, Cézanne and of course, van Gogh) continues to inspire. Starting in Avignon, the route gently follows the flow of the Rhône River to historic Arles. Here, Van Gogh painted and sketched over 300 drawings and paintings. Stretching from Arles to the sandy beaches of Stes-Maries-de-la-Mer and the aqua-blue waters of the Mediterranean is the national Parc de Camargue, which 500 years agos served as a gypsy campground. The famous white Camargue horses now freely roam this land of dunes, as well as black bulls and pink flamingos. 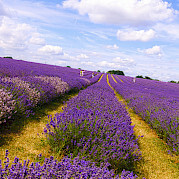 For other bicycle tours in Provence, check out our full list of bike tours in France. Discounts available for triple rooms. Fly to Avignon or Paris. From Avignon, transfer to starting point. From Paris, train transfer from Paris’ Charles de Gaulle airport via Paris-Lyon station to Avignon (TGV), 3-4½ hr. depending on connections. Average high temp in °F for Avignon is 59 for Mar, 67 Apr, 74 May, 82 Jun, 87 Jul, 87 Aug, 78 Sep, 68 Oct & 56 Nov.
Tandem bicycle available upon request. This Provence bike tour is a self-guided hotel tour classified as moderate with flat land intermingled with rolling hills and some steep climbs. 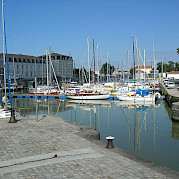 Average of 30 miles per day, with Day 5 serving as a day of rest on the Mediterranean in St.-Maries-de-la-Mer. Sometimes off road cycling is suggested in the itinerary but the paths are relatively short and easy. The dike "Digue a la Mer" consists of approximately 9 miles of dirt path that can be affected by weather conditions. Comfort: swimming pools (except in Avignon and Arles). Superior: swimming pools (except in Avignon). In Arles, spa is available. Extra nights possible by request in Avignon. Please note: Arrivals after 6 pm on Saturdays are not possible. Individual arrival in Avignon followed by a free afternoon in the city. In the evening, an introductory meeting and distribution of additional tour materials will take place. Meeting is possible every day from 3 - 5:30 pm (except on Sunday). In the event of late arrival on weeknights, the meeting is possible the next day in the morning at 9 am. Do note that the office is closed on Sundays so arrival on Sundays will have the meeting on Monday morning at 9 am sharp. If you are planning on a Saturday arrival, be sure that you are able to arrive in time for a meeting that day! 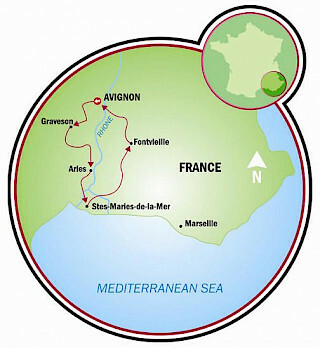 Clients receive tour packet including a map indicating how to reach Provence Bike. The receptionist will phone our local partner so that the time of welcome meeting can then be fixed. Leaving Avignon behind, you will cross the Gard vineyards via typical small Mediterranean villages to the famous Roman aqueduct "Pont du Gard". This aqueduct dominates the river from 50m high. Swimming possible. Before going to the hotel (with swimming pool), you will visit the Provencal village of Barbentane. Crossing the town of Tarascon, you'll discover one of the most beautiful French medieval castles and the famous "Souleiado" factory where Provencal fabrics are made. 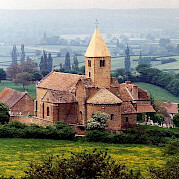 Along the way, you'll come across Daudet's Windmill as well as Montmajour Abbey. Next will be the town of Arles filled with monuments and small animated streets where one should surely enjoy a drink at one of the many terrace cafés. Night in Arles. Leaving Arles, you will slowly enter into the Camargue landscape with swamps, lagoons, and rice fields. Crossing the Rhône by boat, you will arrive in Les Saintes Maries de la Mer where you'll spend two nights in a hotel with a swimming pool. Numerous activities are possible, including horseback riding, boating, canoeing, 4-wheel driving, sightseeing in the village or to the ornithological park. Through the Digue à la Mer dike, which is forbidden to cars, you'll cycle up north towards the small Alpilles massif. Here you'll be greeted by a charming landscape with vestiges of the old Roman setting. Night in Fontvieille, a nice little village at the foot of the Alpilles. Hotel with swimming pool. You'll start today crossing the Alpilles from south to north and pass through the famous villages of Baux de Provence and Saint Rémy de Provence. Then through scenic fields back to Avignon. 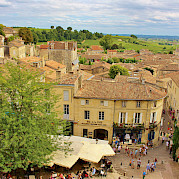 Your Provence tour will end with individual departure from Avignon following breakfast. This tour is run by Transhumance. The IBIS HOTEL we stayed at in AVIGNON did not meet our expectations. The maps were well laid out except there were too many descriptions that told us where NOT to go, poor directions in SAZE, got lost.. Eliminate that. The bikes were great for the trip. We will use you again. Everything about the company and the trip was first class. I would not hesitate to use Tripsite again. We have enjoyed every trip we have taken and look forward to more in the future! Staff was wonderful. Weather not so good but we had a great time. We found the map directions confusing at times--i.e. Cross bridge and 3 streets and turn right. Sounds easy enough, but actually it meant 2 major streets and a round about. We usually solved this by using Google maps. But it added stressful tens of minutes to resolve. 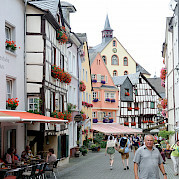 It pretty much meant that we slightly dreaded arriving at even a little village, due to the almost guaranteed confusion. Having the route available as a google map path would have been much much much better. It's the service we pay for, not the specific route. It also made it feel like the route had not been retested for a while. Getting a bit lost wasn't all that bad, and we found some nice paths near Arles. The bikes were state of the art and high quality. None of our group liked the automatic transmission on the Bosch drive. It would frequently incorrectly shift in the middle of a climb and caused a bit of needless suffering. All in all it was a fun time. We couldn't have achieved the Read more… ride without the e-bikes. We thoroughly enjoyed our trip. The accommodations and the dinners provided in the package were excellent. I can speak for all 9 of us that we would certainly use your company again and would recommend it to anyone in search of such a vacation. Thanks for you excellent and prompt service. Everything else was great and would recommend and perhaps book another bike trip in the future.